When you bake as many cakes as I do, it’s safe to say you become pretty obsessed with the kind of butter you use! Westgold butter is a leading brand of butter used here in New Zealand. It is made using the best quality cream, which comes from free-range and sustainable farming practices. Westgold’s salted and unsalted butter are perfect to use for baking and cooking, as well as spread on your toast in the morning! I have used their salted butter to make these lemon, hazelnut and chocolate meringue tarts, which are a perfect treat for summer occasions and New Year Festivities. 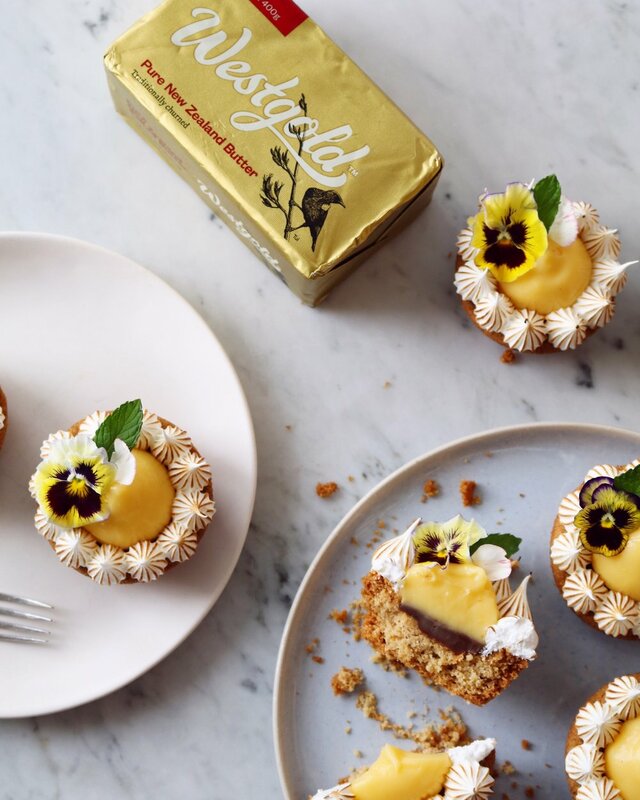 They consist of a buttery hazelnut shortbread base, a layer of smooth dark chocolate ganache, a dollop of silky lemon curd, finished off with fluffy vanilla meringue. Read more about Westgold butter here on their website. 1. Preheat your oven to 170°C. Grease a 12-hole muffin tray with spray oil or melted butter and set aside. 2. Start by making the hazelnut shortbread bases. Using electric beaters, cream together the butter, sugar and egg yolk in a medium bowl for around 2 minutes until creamy and paler in colour. Add the ground hazelnuts, flour, baking powder and salt and beat until just combined. Divide the mixture evenly between the greased muffin holes and spread out evenly. Bake in the preheated oven for 30 minutes, or until golden all over (the mixture will rise and sink in the middle, however this is meant to happen). Leave to cool in the tin until warm before removing the shortbread bases from the tin. Set the shortbread bases aside. 3. To make the lemon curd, whisk together the lemon juice, sugar and egg and egg yolk in a small saucepan until combined. In a small bowl, whisk together the cornflour with one tablespoon of water to form a slurry. Whisk the cornflour slurry into the mixture in the saucepan until combined. Add the butter and place the saucepan over a medium heat. Whisk the mixture over the heat until the butter has melted. Continue to whisk over the heat until the mixture has thickened and starts to bubble. Once the mixture starts to bubble, continue to whisk over the heat for a further minute. Remove from the heat and pour the mixture into a bowl. Cover with cling film and set aside in the fridge to cool. 4. To make the chocolate ganache, place the chocolate and cream into a small heatproof bowl and microwave for 40 seconds. Remove from the microwave and stir until smooth and glossy. Spoon a teaspoon of the ganache into the middle of each shortbread base and place them into the fridge for about 30 minutes to allow for the ganache to set. Set aside. 5. To make the vanilla meringue whisk together the egg white and castor sugar in a small bowl. Place the bowl over a saucepan of simmering water; making sure that the base of the bowl does not touch the water. Whisk the mixture continuously over the heat for 4 minutes. Remove from the heat and whisk in the vanilla bean paste. Using electric beaters beat the mixture on a high speed for about 4 minutes to form a thick and glossy meringue. Spoon the meringue into a piping bag fitted with a small star tip nozzle. Pipe the meringue around the outside of the shortbread base. If you have blowtorch, you can toast the outside of the meringue until golden, however this is optional. 6. To finish, fill a piping bag with the cooled lemon curd and pipe a dollop of lemon curd into the middle of each shortbread base. Decorate with edible flowers and fresh mint if desired. Store the tarts in the fridge. They will keep for up to 3 days.